Lenovo held its annual Tech Life event at IFA 2018 last night. It unveiled a host of new smarthome, AR and PC devices and we will be concentrating on the latter. Perhaps of greatest interest to HEXUS readers will be the new ThinkPad X1 Extreme which packs up to Intel 8th Gen Core i9 processors, discrete Nvidia graphics, and Dolby Vision HDR display and is the first 15-inch X1 series laptop. Several other laptops were also newsworthy: like the Yoga Book C930, the world's first dual display laptop with E Ink; or the thin and light Yoga C630 WOS, the industry's first device to be powered by Qualcomm's latest Snapdragon 850. There were Legion Gaming updates, new Chromebooks, and the Star Wars: Jedi Challenges Dark Side Expansion was announced too. This new laptop is the first ThinkPad X1 in the 15-inch form factor and the first to come packing discrete graphics. Lenovo says it is aimed at advanced users and prosumers who seek a thin and light laptop that delivers high performance computing. Inside you will be able to configure up to the latest 8th Gen Intel Core processors, up to i9. The discrete GPU chosen by Lenovo is the Nvidia GeForce 1050Ti, which is good enough so "users can also sneak in time with their favourite games," after completing their more serious tasks, says Lenovo. Up to 64GB of RAM and dual PCIe SSD storage option with Raid 0/1 capability are possible. The 15.6-inch screen is a 4K panel with 100 percent Adobe RGB gamut and Dolby Vision HDR. The strong visuals plus Dolby Atmos immersive audio sets the bar high for content creation or consumption activities. Other notable features of this laptop are its ThinkShutter camera cover, Windows Hello facial recognition, touch fingerprint reader, industry leading key travel of 1.8mm, and voice control features with Cortana Premium and Amazon Alexa. Users can achieve up to 15 hours of battery life and Lenovo's rapid charging can recharge the laptop to 80 per cent in just one hour. 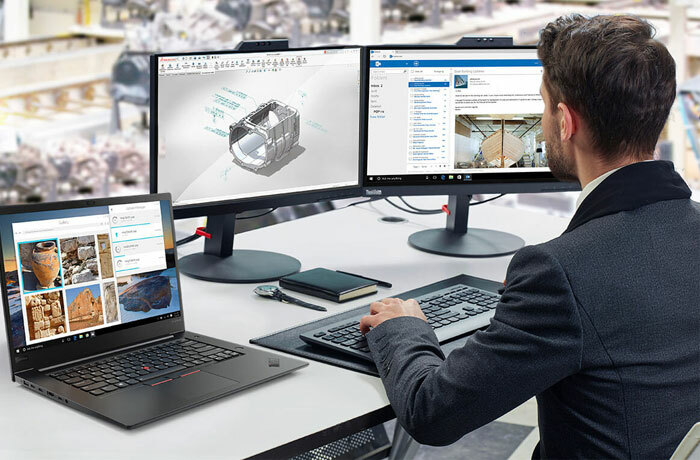 Despite the larger size, the new ThinkPad X1 Extreme weighs in at just 3.76 pounds (1.7kg), which might be facilitated by the reinforced carbon fibre and aluminium alloy construction. Lenovo said the ThinkPad X1 Extreme will be available in the US/EMEA from September with a starting price of $1,859/€1,695. If you want a Core i9 processor you will have to wait until December. This laptop is the world's first dual display laptop with E Ink. As you can see in the photos, it replaces the keyboard deck with a 10.8-inch Full HD E Ink display with haptic feedback. 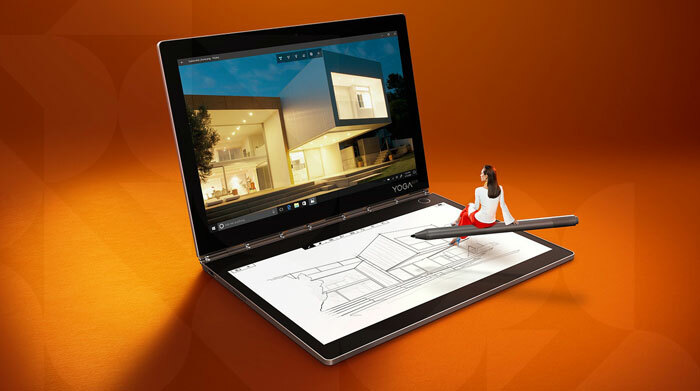 Lenovo has built this tech into a 10.8-inch form factor with accompanying 2560 x 1600 IPS touchscreen. The device supports a Wacom Active Pen (included in garage) with 4096 pressure levels. Inside there is a 7th-Gen Intel m3-7Y30 or 7th-Gen Intel i5-7Y54 processor, 4GB of RAM, and up to 256GB SSD. The Yoga Book C930 weighs just 775g and is 260.4 x 179.44 x 9.9mm in size. The 35.8Wh battery is said to be good for up to 8.6 hours. This Windows 10 device also features two USB 3.1 Type-C ports, and a fingerprint sensor. One nice feature worth mentioning is that if this very portable laptop is closed, you can knock kock on the lid and it will pop open. Lenovo's Yoga Book C930 will be available in EMEA from end of September with a starting price of €999 (inc VAT). In addition to the above Lenovo launched the thin and light Yoga C630 WOS, the industry's first device to be powered by Qualcomm's latest Snapdragon 850. It has integrated LTE Advanced Pro with up to 25+ hours of local video playback. A premium Yoga C930 laptop was announced (note this is not the 'Book'), powered by 8th Gen Intel Core processors, with a garaged pen, and debuting a rotating sound bar with Dolby Atmos Speaker System. Three new Chromebooks also featured at Lenovo's IFA event, one of them being a premium Yoga design with up-to 4K near edgeless touchscreen, and the performance of 8th Gen Intel Core processors, SSD storage, DDR4 memory, and up to 10 hours of battery life. 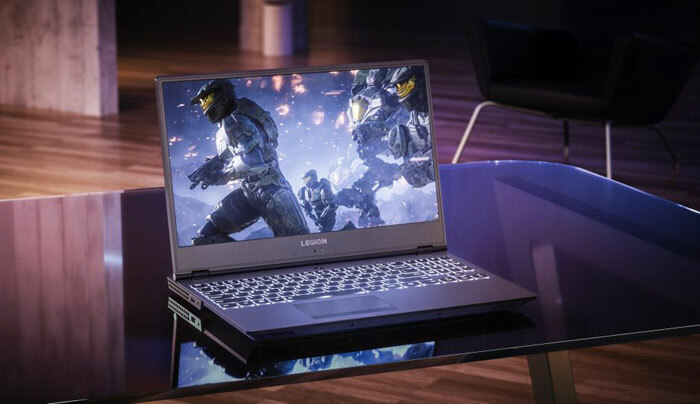 Lenovo's Legion Y530 Laptop, pictured above, got a GTX 1060 upgrade. It will become available in October, from €1399 (inc VAT). Finally, two Lenovo Legion desktops (Legion T730 and C730) are being upgraded with the latest Nvidia GeForce RTX2070, RTX 2080 and RTX 2080 Ti GPU options. You can read more about all the above new PCs and Lenovo's smart home gadgets at the official Lenovo Tech Life event site and on Microsoft's Experience blog. Lenovo has also put together a YouTube playlist featuring many of the newly announced products. Finally, two Lenovo Legion desktops (Legion T730 and C730) are being upgraded with the latest Nvidia GeForce RTX2070, RTX 2080 and RTX 2080 Ti GPU options. This interests me more, they aren't classifying them as ‘M’ parts and those chassis' aren't exactly large so the new 20xx series might shrink into mobile form factor quite well!